Chaukhutia is a pristine town adorned in the Almora district of Uttarakhand. It is perched at an elevation of 1646 metres above sea level and is cradled on the bank of the Ramganga River. 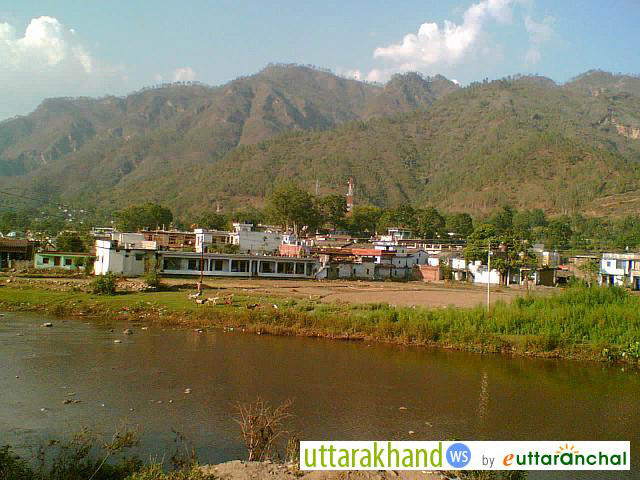 The town of Chaukhutia is situated at the meeting point of four picturesque and important places of Uttarakhand. The tiny village of Chaukhutia is known for its religious and historical significance one see the ancient temples, old forts and the ruins of the Katyuri dynasty, narrating the untold stories of the past. Chaukhutia is an explorer's delight as one can traverse through the colossal Pandukholi caves, which were built by the Pandavas during their stay in Chaukhutia. One can also admire a spectacular view of the quaint valley of Dwarahat, Ramganga from this place. The popular tourist's attractions located in the vicinity of Chaukhutia are Doonagiri and the Rudreshwar Mahadev temple. One can indulge in the spiritual bliss of Kali temple aka Angeri Devi temple situated only half a km away from Chaukhutia in Jurasi road near Dhudalia village, on the banks of Ramganga River. Another ancient Hindu shrine called the Lakhanpur temple, which was built by the Katyuri kings is only 6 km away from Chaukhutia, in Jaurasi-Chaukhutia road. The temple hosts a small fair each year around October-November. Chaukhutia is also a great place for hiking as small treks to Doonagiri, Jaurasi and Jwarhat can be commenced from here. For excursions, one can visit Almora, Nainital, Kausani and Ranikhet that are located in the proximity of Chaukhutia. The unique name of Chaukhutia is derived from the word ‘chau-khut’ which literally suggests 'four feet' in Kumaoni dialect. In respect to the Chaukhutia village, the four feet refers to the four directions or ways that lead to the town. The first way is towards Ramnagar, the second is towards Karanprayag, the third is towards Ranikhet and Almora. While the fourth way is towards Tadagtaal, Kheera. From here the entire region can be easily accessible. Village Walk: Chaukhutia is known for its vast agricultural fields and enveloping lush greenery. The region can be easily explored and impromptu visits can be made to local villages to learn about their way of life, customs and festivals. The rustic life of hills is always inspiring. Nature Trails: There are many natural trails in and around Chaukhutia where one can indulge into natural walks amidst the oak and deodar forests by the riverside. The serenity of the place is something that attracts travelers to Chaukhutia. Due to its relative obscurity, Chaukhutia is one of the hidden jewels of Uttarakhand. Camping: Camping is another good way to spend time with your family and friends to spend some quality time in the lap of nature. Being situated by the river side, Chaukhutia is an ideal place to camp and enjoy the beauty of nature. There may be no ATM or petrol pumps at Chaukhutia so it would be wise to get you money at Ramnagar, Nainital or Almora before you proceed towards Chaukhutia. Avoid travelling to the hills in monsoons as the weather is unpredictable during this time. The roads and the trekking route tend to get slippery and the region is prone to unexpected landslides, cloudbursts and road blocks. Being a small hamlet, with picturesque natural surroundings, Chaukhutia doesn’t have many options in terms of accommodation. Only a handful of budget guesthouses and lodges are available with limited facilities. Another option is to find a place to stay in Almora which is only 88 kms from Chaukhutia and opt for a day trip to Chaukhutia. Almora has plenty of accommodation options ranging from luxury to budget accommodations. Due to being a scarcely populated town, food eating options are limited at Chaukhutia. One will find roadside food stalls and local restaurants that offer known North Indian and Chinese dishes like noodles, momos etc. Local Kumaoni cuisines is worth giving a try as one can taste all sorts of indigenous dishes like Chainsoo, Gahat Dal, Sisunak Saag,Kappa to name a few. Restaurants at Almora may offer the variety and quality as there are plenty of eating joints there. Chaukhutia's historical past and religious significance can be seen basking in its glory in the nearby areas. Kali temple, Vaishno Devi's temple, ancient fort and ruins of Katyuri dynasty all makes Chaukhutia an explorer's delight. The town of Chaukhutia sprawling over an area of 12 square km is a perfect winter destination as the region experiences chilly winters accompanied by heavy snowfall. The best time to visit this place is between the breezy months of October-February. The fertile valley of Chaukhutia is known for yielding quality rice, wheat, and mangoes. Not many people know that this sparse village is also an angler’s paradise as it is popular for fishing. This sleepy lesser known village was once popular for being the capital of the Katyuri kings. It was referred to as Rangilo Gewar during that period. What is Chaukhutia famous for? Chaukhutia is famous among tourist as Small Town, Major Connecting Point. Chaukhutia is popular destination for following activities/ interests - Angling. Travelling to Chaukhutia in 2019? Contact us for planning your Chaukhutia tour with best travel packages of as per your requirements!